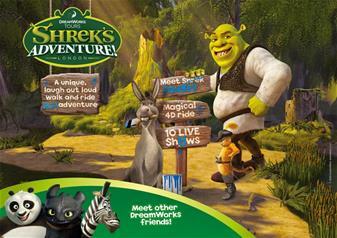 An exciting adventure for kids and Shrek fanatics in London; experience the brand new attraction from Dreamworks Films and take a trip to the realm of Far Far Away including the chance to meet Shrek and plenty of his friends along the way. Start by boarding a magical ‘Dreamworks Tours’ red London bus driven by none other than Donkey himself! A 4D bus ride packed with chaos, calamity and bags of fun, travel to the entertaining and enchanted worlds of Far Far Away. A dream-come-true for kids anywhere, work your way through 10 fairy-tale themed shows as you travel through key locations from the Shrek movies, including the Muffin Man’s House and the Poison Apple pub. Encountering characters such as Princess Fiona, Sleeping Beauty, The Three Blind Mice, Puss in Boots and Pinocchio, complete the task to find Shrek and the magic portal that takes you back to London, getting the better of angry Rumpelstiltskin along the way. Unleash your Panda Power at Shrek's Adventure, when Po and Shifu make an extra special appearance this Easter. Test your warrior reflexes with an interactive punch bag challenge learn to levitate in the Training Academy. The first of its kind in the world, this a completely new Shrek story told in a unique and exciting way that will have kids absolutely enthralled from start to finish. Student prices are available for students aged between 16 and 25 years with valid id.